Soccer movement is imperative to any team's success in the sport of soccer. Every successful team usually has this element naturally happening amongst their team. - This soccer movement drill is set up 4 cones in a diamond shape equal distances apart. - Set up your players (12 minimum for this drill) with 3-4 per cone. - You need lines 1 and 2 to begin with a ball at their feet. - The dotted lines mimic the ball directions, solid lines mimic the runs made. - Balls always passed between the same two lines regardless of player movment. 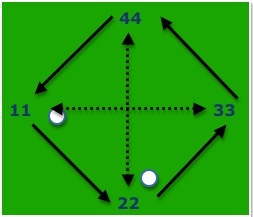 - The two balls should never meet in the middle, building on player awareness and communication. - Runs should be a quick, short burst of a sprint to the end of the respected line. - Players should take 2 touches each time, 1 to control the ball out of their feet, and the 2nd to make a quality pass to their teammate. - Example: 1st player in line 1 passes to 1st player in line 3, 1st player in line 1 sprints to end of line 2 after making his pass. At the same time, but avoiding balls hitting, 1st player in line 2 passes to 1st player in line 4, then line 2 player sprints to end of line 1. Balls continue back and forth as the players will rotate one line to the right after making a pass as the 1st player in their line. - Passes should always be made along the field surface. - Passes should always be accurate to the opposite facing line. - Players should make their sprint immediately after the pass, not stand admiring their pass before running. - Soccer movement should be a constant habit, moving into space following a pass. - Once players understand the expectation, challenge them by having an action for anytime the balls collide, or pass goes astray, such as pushups or sit-ups. Just a short and sharp set of 5-10 then back up and the drill again. - This drill also works on your soccer players conditioning, and pushes your team to make accurate, quality passes as they begin to tire, which is typically when players make more mistakes. - Limit passes to 1 touch. - Have the players sprint aroundthe line to their right and finish the sprint at the line across from them, so they sprint 2 lines rather then just 1. - Have the players sprint to the right, but around 2 lines, ending on the line to their left. - Have them sprint the entire diamond back to their original line. This is a challenge and should have them communicating a lot and weighting the passes appropriately, but is a very difficult step to have success on. - 10 minutes for this soccer movement drill.